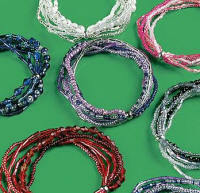 12 Assorted glass & plastic multi-strand bead stretch bracelets. Assorted styles on elastic bands. Each individually wrapped. Each one measure about 7" around (not stretched).